Coming off of a tough loss against No. 16 Duke last Friday, Pitt men’s soccer was looking for a revival. In a tense matchup against in-state rival Penn State Tuesday at Ambrose Urbanic Field, they found just that. Pitt (7-6-0, 1-4 ACC) edged out Penn State (2-8-2, 0-5 Big 10) in a heart-pounding overtime thriller, 3-2. Pitt controlled the game on offense, but PSU held their ground and capitalized on the few opportunities they had to score, sending the game into overtime. Entering the contest, the teams had faced off 32 times, with Penn State leading the all-time series 23-6-3. The Panthers dominated the possession battle in the first half, firing 11 shots to the Nittany Lion’s two. They also had more shots on goal, sitting at five to two over their opponent. First-year forward Colin Brezniak was responsible for six of the Panthers’ first-half shots, although none found the back of the net. But despite creating more offensive opportunities than their opponent, the Panthers managed to convert on just one of them, when Brazilian first-year midfielder Marcony Pimentel found himself all alone in the left side of the box following a deflection. He rocketed a shot that bounced off the Penn State goalkeeper’s hands and into the top of the net, giving Pitt a 1-0 lead in the 29th minute. Penn State’s defense held firm despite the flurry of attacks from the Panther offense. First-year goalkeeper Josh Levine led the effort with four first-half saves. After a physical battle for the ball, a small scuffle broke out in the 34th minute. During a stoppage in play, PSU freshman Callum Pritchatt shoved senior Pitt defenseman Bryce Cregan to the ground. The referees handed the Nittany Lion a yellow card for the incident. Shortly after the foul, PSU responded — Pritchatt netted a goal minutes later to tie the game 1-1 in the 37th minute. 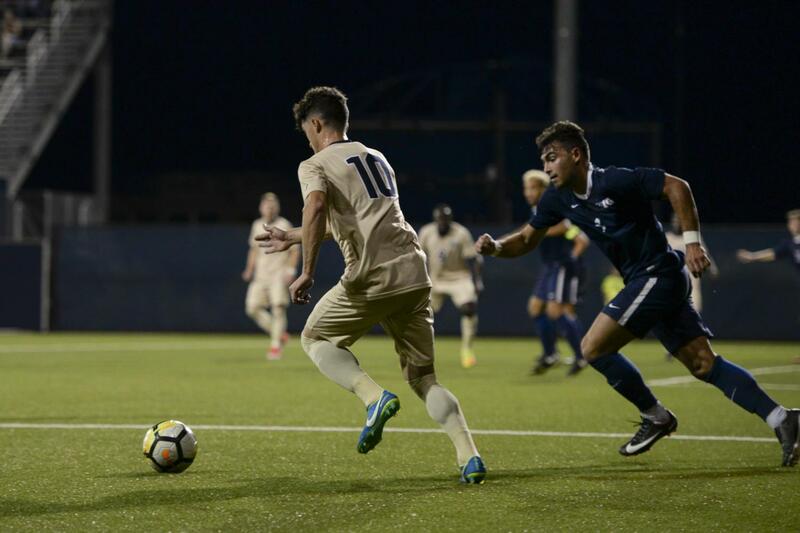 Tensions reached a peak in the 44th minute when Pitt junior midfielder Javi Perez received an elbow to the face from the Nittany Lions’ Travis Keil. Refs gave Keil a red card, setting the Panthers with a one-man advantage throughout the remainder of the contest. For the first 30 minutes of the second half, the depleted Nittany Lion defense continued to withstand Pitt’s offensive assault. After eight shots and three more Levine saves, the Panthers took a 2-1 lead in the 75th minute when freshman forward Alexander Dexter cashed in on a cross from junior defender Tom Moxham. With a one-point lead and one-player advantage over its opponent, Pitt appeared to be on a path to victory. But Levine continued his standout performance, saving four more shots throughout the remainder of the half. His efforts paid off, as Penn State first-year midfielder Ethan Beckford tied the game up at two apiece with one minute left in regulation. As the game went into overtime, the Panthers and Nittany Lions exchanged unsuccessful shots, three of which came from Perez. On his fourth shot, he sent the game-winning goal into the net past Levine for his second goal of the season. Overall, Pitt finished the game majorly outshooting Penn State, 30 to six, with 13 shots on goal. Head coach Jay Vidovich was happy with the win, but was disappointed that his team let up a tying goal in the last minute of the match. The Panthers look to make it two straight as they take on No. 7 Notre Dame Friday evening in South Bend, Indiana.